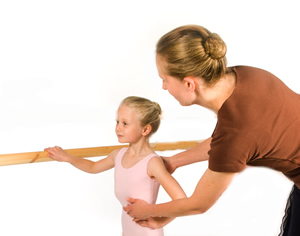 Nina Salmon is the principal of Monnow Ballet School and a registered teacher of the Royal Academy of Dance (RAD). She discovered her own passion for ballet as a child, after a visit to Covent Garden to see Romeo and Juliet. The astonishingly high jumps of the male dancers and the fast pointe work of the ballerinas created such an impression that she was inspired to learn herself; even today that image is still with her as she teaches her pupils. Nina Salmon was very fortunate to live near the headquarters of the RAD; full-time students there needed children to teach; lecturers needed to demonstrate to their students how to teach and also to assess their students’ progress; so the children in these twice weekly demonstration classes received excellent tuition in the intricate RAD syllabus. Apart from attending the RAD children’s classes, Nina also received inspiring lessons from Denise Winmill, who taught students at the Upper School of the Royal Ballet School, and by Ann Adams, who had been trained by Marie Rambert. Nina began ballet in mixed ability classes; from this experience stems her firm belief that all children should be given the opportunity to enjoy dance. 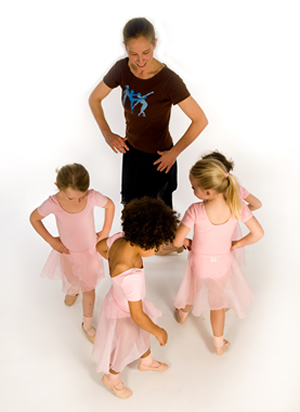 Some children, with whom she learned, had the ability to progress to further vocational training and two are currently with the Royal Ballet Company; others have explored different styles of dance. However, all have benefitted from the knowledge and discipline that ballet brings. She performed in Lea Anderson’s Reverse Effect at the Queen Elizabeth Hall and with the National Youth Ballet at Sadlers Wells, thus giving her experience of the work involved in productions and the highly competitive world of professional dance. Finally returning to the Royal Academy of Dance for her own teacher training was a wonderful experience for Nina; it was also a way to put all her dance knowledge together and to refresh the expert teaching she was given from a young age. 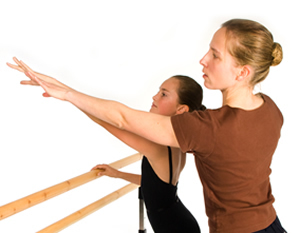 Nina Salmon takes all current classes and aims to bring the highest standards of teaching and her love of ballet to young students across the county. heels touching, toes facing outward.